Palak Paneer – The Ultimate Opera on a Plate!! To make the purée of spinach, wash the spinach leaves in cold, running water to remove all the grit. In the meantime, boil plenty of water in a degh and remember to add a pinch of turmeric as it comes to the boil. The turmeric will keep the saag bright. Haldi, betae is not to make the spinach yellow but it brings out the vivid colours and brightness of the spinach – turmeric is the best known anti-oxident to mankind!! We have even used it for thousands of years to make Ayurvedic facial creams!! Anyway, add the spinach leaves to the boiling water and use the good, old-fashioned ‘timer’ of touch to test when it’s done. You know it’s ready when the water comes back to the boil and the leaves can be mashed when squeezed between the thumb and the forefinger. As soon as you can do this it’s time to stop the spinach from cooking, immediately. So, drain the spinach and submerge in ice-cold water, NOW!! Next, squeeze the cooked spinach to drain out any excess cold water and purée in a blender. Now get ready to temper the purée. Tempering prevents any further oxidation from taking place and in the process preserves the natural colour of the spinach. In a pan heat the oil, crackle some brown cumin seeds, add some crushed garlic cloves until lightly caramelised and then add the purée. Stir it through until all the moisture has disappeared and the spinach appears glossy. Allow to cool and set aside. This is just the first step! At the training kitchen, the paneer was unfortunately pre made in the kitchen which was a big disappointment for me as I was looking forward to learning the little secret to making it that was known only to the Mithai-wallas in the hotel. I had to wait a full year to learn the technique and when it happened I knew this dish had to be better than an opera at La Scala! For 4 litres of full-cream milk (yes, bought from the supermarket! ), we need 400 ml of fresh cream (again, bought from the supermarket! 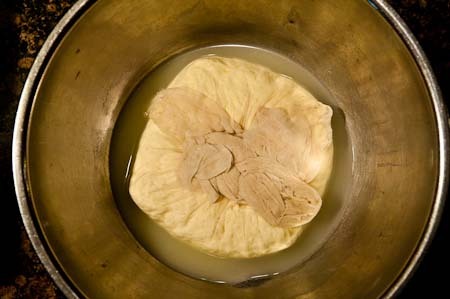 ), around 250 ml of white vinegar (this keeps the colour white and ‘clean’ in appearance), some muslin (cheesecloth), a heavy-based pot, a spatula, a strainer, and lots of Fursat and Mohabbat. This will proudce around 1.5 kg of paneer in Australia and believe you me, I have never had a problem! Bring the refrigerated milk to room temperature then pour into your hot pot and over a high heat, stir constantly in a figure of 8. 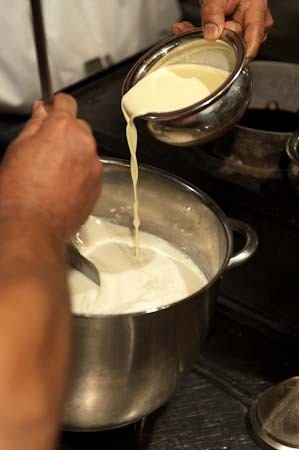 Add the cream gradually to the milk without dropping the temperature of the milk and stir until the milk is just about to boil. Keep the vinegar handy along with the muslin which has been washed and squeezed and then laid in a strainer set over a large pan. 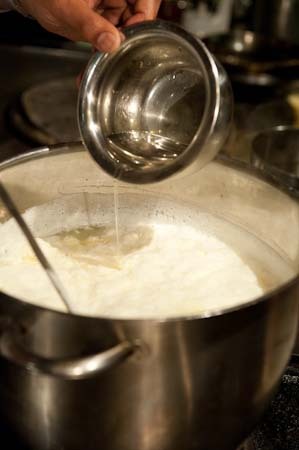 Let the milk boil (but don’t let it ‘boil over’), turn off the heat and gradually add the vinegar to the milk, stirring slowly until the whey separates from the curds and is colourless. 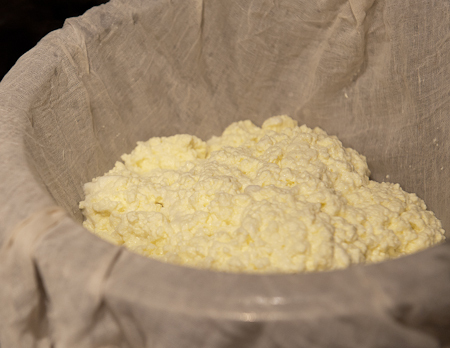 Strain the curds into the muslin-lined strainer until only the colourless whey is left in the pan. Gather the muslin to form a bundle and tie a knot. Place the muslin on a large plate/tray. 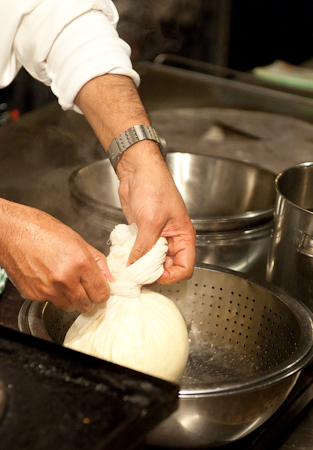 Place the pan of whey on top of the muslin to allow the paneer to set. This usually takes between 2–3 minutes [or ask your son to count up to 200: 1, 2, 3, 4 and so on, and not 10, 20, 30 like my son Aniruddh!!]. Set the pan aside and do not throw away the whey as this will eventually become the ‘culture’ that can be used in making the next batch of paneer and also baking bread. 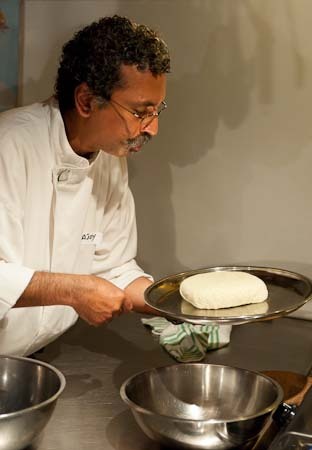 In my restaurant the culture is used to make Khameeri naan, a totally eggless bread with no baking p0wder either!! Anyway, It’s now time to check our creation. So, undo the knot and . . . Insha-allah!! Undo the knot and . . . Insha-allah!! Step three, making the sauce is the easy part. In a heavy-based pan add oil, preferably some kind of a neutral oil as it is just a medium (I do not cook with ghee), the flavours will come from the spices and the herbs! Cook some onions without letting them change colour along with some salt (which brings out their sugar), over a low heat – this cooks the onions from inside out. All the other ingredients are then added ‘layer upon layer’ along with the tomatoes till they are soft and their skins come off. It’s now time to add the bhunaoed saag to the sauce, followed by the paneer, either cut into dice or thick slices, it’s your choice! Lastly, add some dried, crushed fenugreek leaves which helps prevent any flatulence. Mind you, this is high-protein diet!! Finally folks, serve on a plate with Dal Makahni and a Khameeri Naan, and you have more than opera on a plate – this is an opera you can actually smell and eat!! Anah Kartaa (and not daata, for a change!) Sukhi Bhava!!! If you want specified amounts in order to make your own paneer at home, click paneer recipe. If you want to make a delicious palak paneer, click palak paneer recipe. Good luck! Posted in Basics, Classic meals, Cooking, Recipes, vegetarian and tagged methi kasoori methi, naan, palak, paneer, saag. Bookmark the permalink. i've been a chef for over three decades now! 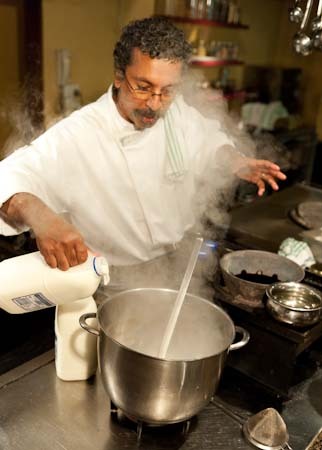 i trained in chennai and started off with the taj hotel group. 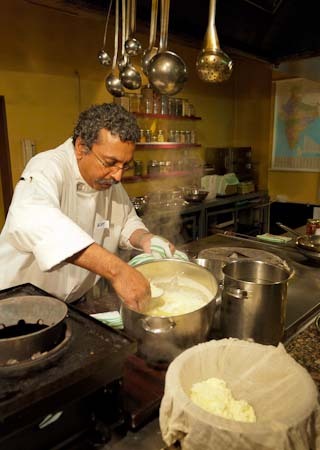 i've owned nilgiri's indian restaurant in sydney for over 15 years. i'm on a mission to dispel the myth that indian food is no more than a 'curry in a hurry'! come with me as i try and educate. indian food is my passion (alongside cricket!) and i'm enjoying exploring the new social media and as well as having published cookery books i'm now moving into videos. simple and easy to follow that don't go on for hours like some Bollywood movies! Why is it that palak is always ground, not coarsely chopped ala home style. Dont you think panner will taste better with chopped palak?? BTw whats a Khameeri nan ? never heard of it. 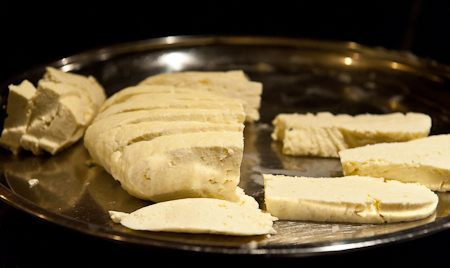 Khameeri nan is like khameeri roti, except that this is made out of plain flour, also called SOUR DOUGH bread. thank u for all the lovely recipes and detailed instructions ! We always use lemon for making paneer (in India, i.e.). I’ve yet to get anything but white paneer from that. I may be absolutely wrong here though and totally colourblind to boot! Why wouldn’t that work in other countries as well? Beautiful… The tip to keep the colour and freshness of palak intact always always works! I like to add dollops of butter in the end. Please check my recipe http://noodles4thoughts.wordpress.com/2014/06/30/crunch-of-mix-exotic-veggies/ . Would be honoured to have your suggestions and tips..